A bunch of old, out-of-touch white guys babbling about slavery. The Republican Party hasn’t changed much. Well, back then, as the party of LINCOLN, they were trying to free the slaves; nowadays, they’re working to get them all back. My main question about this ambitious film is: With all the camera operators, production assistants and director’s assistants and supervisors and costumers, no one in the whole production bothered to tell Tommy Lee Jones that his wig was on crooked? During the American Civil War, Daniel Day-Lewis becomes the 16th President of the United States and frees the slaves with his beard on straight. With his third Best Actor Oscar on the shelf for this role, it is safe to say this is the most authentic Lincoln we will ever see on film or television. This is not just another stovepipe fakester and cheap platitude knockoff – this is Daniel Day-Lewis once again immersing himself in a role so fiercely, underplaying yet bringing the thunder, that our scrapbook notions of Lincoln from all those tinted photos and decades of milky imitations all cohere into an inspirational reality. This is director Steven Spielberg crafting a film around the writings of Doris Kearns Goodwin‘s book Team Of Rivals, portraying a canny politician, an affectionate father, a legendary hero, a fallible man, and the world’s most famous beard (besides Nicole Kidman). Modern Republicans love to crow over Lincoln being the abolisher of slavery – as in a Republican bringing about slavery’s demise (only citing that feather in their caps because their modern party has been correctly identified as unsheeted Klansfolk). It is also intimated by modern Republicans that the whole Republican Party of Lincoln’s time went along for the ride. But it didn’t. (Modern Republicans lying and trying to rewrite the past? How rare is that?…) LINCOLN shows how many of Lincoln’s own party would unashamedly block the abolition of slavery (aka the 13th Amendment, aka the Emancipation Proclamation) unless it came with the condition of ending the war with the South. I will repeat that, as the concept is so foreign to modern Repubs: ending slavery was contingent on ending the Civil War. That is, Repubs wanted the war to END. Back then, there were no monetary incentives tied to continuous war. War meant actual war, not corporate profiteering, as it does today. And if the war didn’t end, then they would not abolish slavery. No principles (as usual), just money-saving agenda that would benefit only themselves. So modern Repubs can stop gloating over their party’s altruistic streak of the 1800s – because they possessed as much altruism as they do today – none. Not to say that the Democrats of Lincoln’s time were any better. Not one would vote for the 13th Amendment. They liked their slaves as much as their white Republican brothers did. LINCOLN delves deep into how the Emancipation Proclamation impossibly worked and how Lincoln technically “un-legally” confiscated the slaves from the rebels in the south. Because by confiscating the slaves as “property,” it is an admission that he considered them property, but the whole point of acquiring them was to assert that they were NOT property, but people with rights. And “the South” was not a sovereign country, so Lincoln could not declare war on it, “The South are not the people that are rising up – it’s the rebels that are living in the southern states.” Lincoln is well aware of the Emancipation’s contradictions and moral ambiguities, at movie’s end lamenting to his military strongarm Ulysses S. Grant, “We made it possible for one another to do terrible things.” Writer Tony Kushner has compacted all these conundrums into dialogue so cogent that your faux-popcorn is gonna go cold – either because you are riveted by this political drama, or you’ve fallen asleep. I decided that the Constitution gives me war powers, but no one knows just exactly what those powers are. Some say they don’t exist; I decided I needed them to exist to uphold my oath to protect the Constitution, which, I decided, meant that I could take the Rebel’s slaves from them as property confiscated in war. That might recommend to suspicion that I agree with the Rebs that their slaves are property in the first place. Of course I don’t, never have. I’m glad to see any man free, and if calling a man property, or war contraband, does the trick… Why I caught at the opportunity. Now here’s where it gets truly slippery. I use the law allowing for the seizure of property in a war knowing it applies only to the property of governments and citizens of belligerent nations. But the South ain’t a nation, that’s why I can’t negotiate with ’em. So if in fact the Negroes are property according to law, have I the right to take the rebels’ property from them, if I insist they’re rebels only, and not citizens of a belligerent country? And slipperier still: I maintain it ain’t our actual Southern states in rebellion but only the rebels living in those states, the laws of which states remain in force. That means that since it’s states’ laws that determine whether Negroes can be sold as slaves, as property, the Federal government doesn’t have a say in that, least not yet. Then Negroes in those states are slaves, hence property, hence my war powers allow me to confiscate ’em as such. So I confiscated ’em. But if I’m a respecter of states’ laws, how then can I legally free ’em with my Proclamation, as I done, unless I’m cancelling states’ laws? I felt the war demanded it, my oath demanded it. I felt right with myself, and I hoped it was legal to do it. I’m hoping still. Two years ago I proclaimed these people emancipated – “then, henceforward and forever free.” But let’s say the courts decide I had no authority to do it. They might well decide that. Say there’s no amendment abolishing slavery. Say it’s after the war, and I can no longer use my war powers to just ignore the courts’ decisions, like I sometimes felt I had to do. Might those people I freed be ordered back into slavery? That’s why I’d like to get the Thirteenth Amendment through the House, and on its way to ratification by the states, wrap the whole slavery thing up, forever and aye. As soon as I’m able. Now. — Daniel Day-Lewis, as Abraham Lincoln. Touching dialogue between Lincoln and his “slave,” as she asks “Do you want us here?” Like every great diplomat, Lincoln doesn’t say yes or no, but what he does say is the mark of an understanding man – that there is no yes or no answer, stating that he doesn’t know her, but he’s sure that he can get used to her. 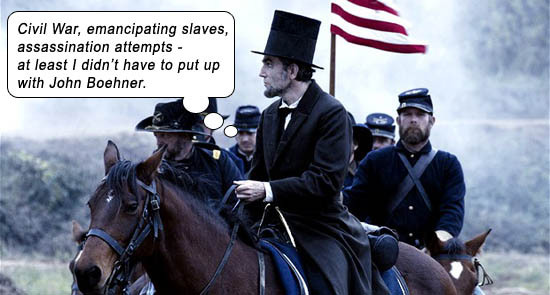 And, he admits regretfully, he doesn’t know what will happen to the slaves once they are freed. On the morning of the vote, African-Americans (those that were “free men”) file into the balcony as spectators to congress’s machinations. The rep on the floor welcomes them: “We welcome the people – to your house!” His voice hitches on “your” – anytime someone’s voice hitches, it gets me. Not just the fact that their voice hitched, or the emotion associated with it, but the fact that that actor can find that space. The black people want to be a part of this somber, important process – and all they get to see is how stupid, childish and juvenile old white men in congress actually are. So the slaves are freed in an ingratiating orchestra swell. Just like in real life, where each court and congressional hearing has an orchestra ‘pon de side just waiting for the uplifting decision. LINCOLN then does a smart thing – it goes beyond the decision, to the backbiting that follows. For no matter how sensible or altruistic, and no matter the best intentions in the world, any decision in this life is accompanied by dissent, an opposing force irrational and ignorant beyond belief. Jackie Earle Haley leads a delegation from the defeated South, asking Lincoln, “Will we be readmitted to the States in time to block the ratification of this 13th Amendment?” Like modern Republicans, the first thing on the irrational dissenters’ minds is not to adhere to a principled law that they ideologically disagree with, but to block it and repeal it. Nothing’s changed (cough–ObamaCare). I think it has something to do with all Republicans being soulless blood-sucking vampires… or am I thinking of that other, even more serious Lincoln biography ABRAHAM LINCOLN VAMPIRE HUNTER? How ironic that this beard that exhibited such empathy, humanity and principled courage has become the modern Republican Party’s beard. Writers: Tony Kushner, Doris Kearns Goodwin. Starring: Daniel Day-Lewis, Sally Field, David Strathairn, Joseph Gordon-Levitt, James Spader, Hal Holbrook, Tommy Lee Jones, John Hawkes, Jackie Earle Haley, Bruce McGill, Tim Blake Nelson, Joseph Cross, Jared Harris, Christopher Evan Welch, Peter McRobbie. A Smart Movie for Dumb People. Always with the anecdotes, when Lincoln relates a tale about the mathematician Euclid, he has to qualify to his listeners: “I read it in a book somewhere…” Whenever anyone says anything remotely intelligent in an American production, producers feel the need to put extraneous dialogue in the mouths of those characters to qualify HOW they could possibly know something out of their field, “I saw it on National Geographic,” or “I read it in a doctor’s office.” No one can simply have general knowledge?! Even in a movie that spends its time illustrating via deed and dialogue the intelligence of Abraham Lincoln, the filmmakers couldn’t allow him to just “know” a historical figure like Euclid. Lines like this are simply to allow dumb people to continue to relate to the character: no filmmaker wants to alienate his lead from all the drooling masses that might consider him an elitist if he knows too much. What concerns me is why we are allowed to see ubermen (like Tom Cruise in MISSION IMPOSSIBLE II or Liam Neeson in TAKEN) being uncannily adept at all forms of lethality (from all manner of handguns to automatic weapons, to knives or katanas or quarterstaffs, and also throwing in Jeet Kun Do or Drunken Master styles whenever required) and also knowing how to fly planes and drive motorbikes like stuntmen, and also to run or swim or box like Olympic champions – all without any explanation (not even a montage!) on where they could possibly find the time in one human lifetime to get so uber. Why does physical aptitude require no explanation but mental proficiency requires a backstory?